Selected as the Opening Night Film for MoMA’s Documentary Fortnight 2010 (running now through March 3), David Christensen’s The Mirror focuses on an interesting story, presents it pleasantly, yet misses a larger opportunity to really illuminate various aspects of a strange town that it puts on display. In the mountains of Northwest Italy, Christensen finds a small village called Viganella, which from November to February, due to the location of the surrounding peaks, gets no direct sunlight in town. 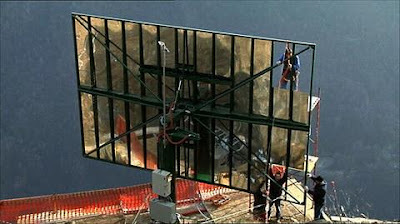 The eccentric mayor, along with a local architect, decides to build a giant mirror and install it in a specific place on the mountains so it reflects sunlight into the village square. The story of the mirror is cute enough, but The Mirror finds its life in the town’s residents. The mayor, Pierfranco Midali, is fascinating to watch as he plans and promotes the arrival of mirror. Basking in this small bit of glory which his town has never seen before (media come from all over – even Al Jazeera, assuring him that they aren’t terrorists), Pierfranco gives The Mirror an energetic presence. A local priest compares the mirror to God’s gift of light. Other locals don’t see what the big deal is, but are happy enough to help. Christensen’s camera captures the beauty of Viganella’s landscape and goes from home to home finding an equally magnificent group of people. Unfortunately, when The Mirror is over, it seems as if the townspeople ultimately get a short shrift. Nearly all the interviews focus on the mirror and what they think it means for the town. Though this central concept is interesting enough, The Mirror grows tiresome after 85 minutes of local musicians and mirror-talk. (Also not helping at all is an embarrassing, tacked-on reflexive conclusion.) As most of the town’s residents see the mirror as a ploy or a social experiment, The Mirror bites into the visitor ideology that it simultaneously tries to break from. Seen as a small episode in a larger project, Viganella’s mirror could be a quirky trait from this unexplored part of the world. The Mirror, however, never wanders far enough from its basic premise to fully explore other elements of Viganella. In missing this opportunity, it feels like a long news piece on a weird little town. At times, you can feel The Mirror trying to break from this mode of address, but it always comes back to the mirror rather than to Viganella. The Mirror was apparently shot over the course of a year, so it’s even more strange that there wouldn’t be footage investigating larger elements of the town, the intimate cross-cultural founders, or the actual lives of the people. With a great opportunity like this, Christensen’s simplicity backfires. It’s a fun vacation/adventure story, sure, but why not look a little deeper next time? 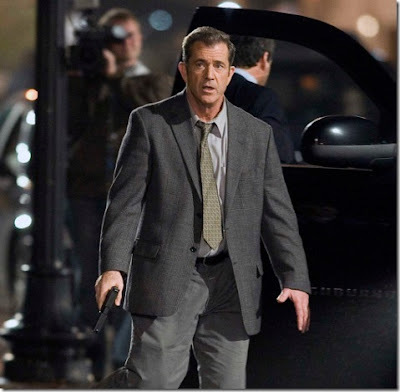 Saturday Night Live, that bastion of incisive film criticism, featured a sketch this week in which Martin Campbell’s Edge of Darkness – a condensed remake of the former Bond director’s own 1985 BBC miniseries – was described as a combination of elements from other horrible Mel Gibson vehicles: Ransom (1996), Conspiracy Theory (1997), and Payback (1999). What’s shocking is how humorously accurate the observation is. Mel loses child. Mel gets obsessed with harebrained political intrigue. Mel goes on a violent rampage. That’s the film. As SNL noted, it’s basically a compilation of scenes from other half-assed Gibson thrillers sloppily pasted together with a nice glob of whiz-bang. The film, which verges on farce, amounts to a jumble of worn-out plot devices, tritely philosophical one-liners, and ridiculous anti-corporate paranoia manifested in a government-sponsored nuclear research company that surreptitiously makes bombs for – gasp! – Middle Eastern terrorists. Seriously? Gibson’s weathered, incessantly snarling mug suggests so. Like SNL, I beg to differ. As mourning/frantic/self-loathing homicide detective Thomas Craven, Gibson’s strained, pseudo-Bostonian bark amounts to little more than a hyperbolic hamfest of grunts, growls, and grumblings, suggesting that the actor may have a future in some sort of post-post-modern comedy shtick (I’m looking at you, Lorne Michaels). 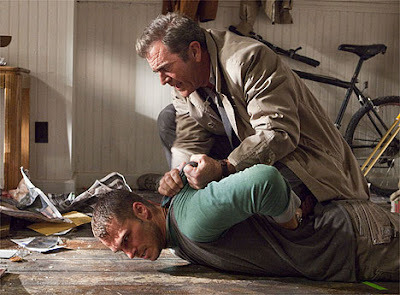 His performance presents an unintentional parody of the revenge-driven macho-maniacal hardass, one that repeatedly pushes the film to the point of hysterics, even when tempered by the typically icy demeanor of Danny Huston as the villainous Jack Bennett, proprietor of nukes and wily murderer of whistle-blowing activists – including Craven’s daughter, Emma (Bojana Novakovic). Tossed into the mix, Ray Winstone, whose talent is sadly squandered, does an adequate job of portraying Captain Jedburgh, an enigmatic British agent with unstable loyalties and a terminal illness who sips Scotch and gets introspective while problematizing Craven’s quest, conveniently popping up and uttering cryptic clues regarding Emma’s death like a hard-boiled whack-a-mole. The convoluted plot unfolds predictably, replete with all sorts of stammering minor characters informing Craven that he’s only seen the tip of the iceberg, that the whole thing goes deeper than he can imagine, that he’s messing with the wrong folks. Craven does not heed their warnings. He continues bursting through doors, tampering with evidence, and getting involved in numerous car accidents depicted with an overabundance of tacky smash cuts. What happened to the Martin Campbell of Casino Royale (2006)? How did he go from directing one of the most crisply and vigorously structured thrillers of the past decade to creating one of the laziest, most hackneyed examples of the action aesthetic in years? Beats me. I’ll chalk it up to Gibson’s soul-sucking aura of boring conventionality haunting the film, just as the maudlin memories of his character’s dead daughter plague the shoddy narrative. 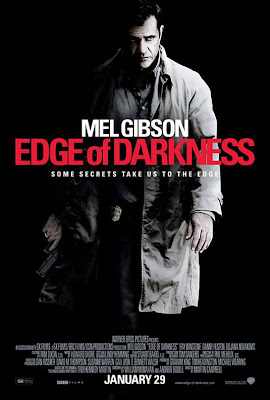 Such pedestrian paranoid-thriller clichés would be somewhat forgivable if not for Edge of Darkness’ complete fumbling of every possible instance of emotional intensity, including the aforementioned moments of sentimental drivel in which Craven recalls/imagines/hallucinates Emma. 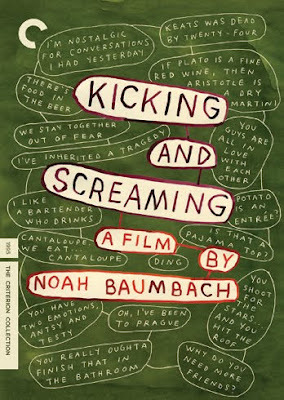 In addition to a few snippets of mysteriously non-diegetic home videos depicting a pint-sized Emma frolicking on a beach, the film features her disembodied voice muttering encouraging words to the despondent Craven – even having full conversations with him in which he all-too-obviously verbalizes his internal struggles – as well as younger versions of her inconsistently inserted into Craven’s surroundings, only to be revealed as his fleeting subjective projections in annoyingly routine reverse-shots. It’s hard to conceive of a film trying any harder to jerk a tear yet failing so miserably. 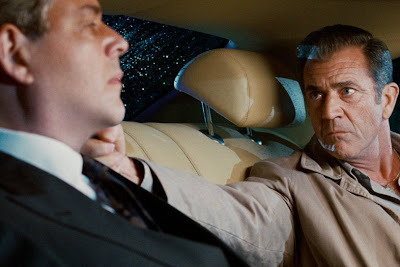 Craven’s memories come off as awkward grasps at resonance that fall into eye-rolling banality, denying any investment in the character’s pain, a problem made infinitely worse by Gibson’s inability to appear sincere in between launching spittle and fists at sneering opponents. But Edge of Darkness is not all bad; it has one great shot and one interesting character. The shot is the first of the film – a wide shot of a picturesque lake at night, moonlit and placid, doused in syrupy shadows. After a few atmospheric seconds of cricket chirps and gently sloshing water, a shape slowly emerges from the water, lumpy and amorphous. Suddenly, two more similar shapes float to the surface. A few glimpses of protruding hands and heads suggest the shapes are formerly submerged corpses, announcing themselves to the dim scenery. The film’s title appears in the center of the frame. Then the rest of the film starts and the provocative noir opening, full of understatement and patience, sinks into cornball slapdashery. The subtle, evocative movie suggested by Edge of Darkness’ first frames would undoubtedly sideline Craven in favor of Winstone’s Capt. Jedburgh, the only character with psychological depth, a moral trajectory, or any memorable qualities. 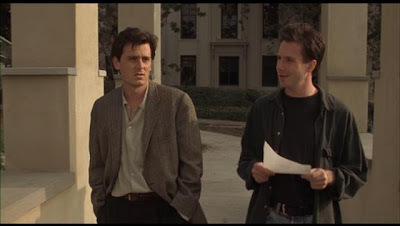 Jedburgh is conflicted, ambiguous, dangerous, and dying – all of which is glossed over, making him merely a useful cog in the film’s dues-ex-machinery. That such a promising character is relegated to serving Mel Gibson scenery to gnaw on is perhaps the worst of the film’s many failures. However, this is The Mel Gibson Show, as every bit of the film’s marketing suggests. Unfortunately, as a chunk of awkward chuckles and did-that-just-happen buffoonery Edge of Darkness is far inferior to the more cinematically-astute SNL; forget about a live studio audience, there’s not even a laugh track.